The rise of the Bitcoin Jump to media player Ayshah reports on the rise of Bitcoin, a completely virtual way of paying for things. She visits a cafe in London where customers can pay with Bitcoins. Bitcoin deposit machine show and tell Jump to media player Rory Cellan-Jones tries out the new Bitcoin deposit machine - a transaction videoed on a smartphone. Bitcoin, a virtual currency which only exists on the internet, has become increasingly attractive as it does not involve exchanging currencies. 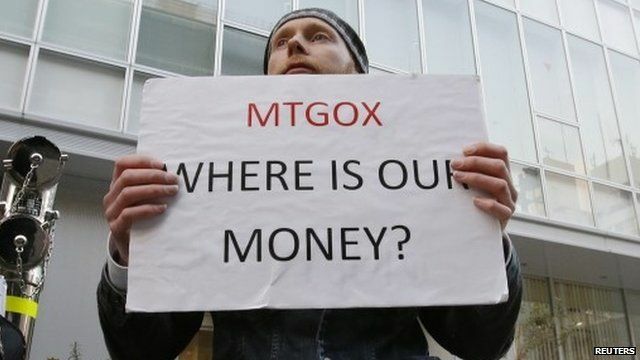 However, it has seen a sharp fall in its value after one of the biggest online exchanges, MtGox, unexpectedly shut down, owing hundreds of millions of pounds and prompting the sharp fall in the value of the currency.